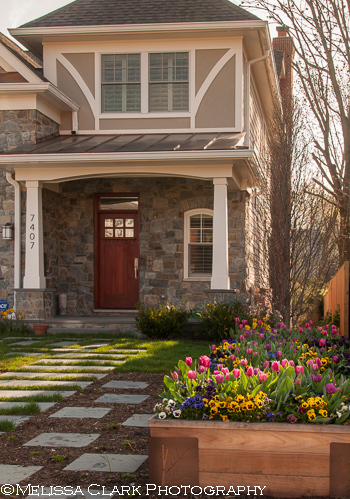 A couple of years ago, I was hired by some new clients who were moving from a large house in the suburbs (with lots of deer) to a new house within walking distance of downtown Bethesda, Maryland, close to our firm’s offices. The lot was narrow and the front faced west. Most of the front yard was going to be taken up by a large two-car-wide driveway, and the husband wanted a shade tree to replace one that had been taken down. The wife wanted an ornamental tree, but she also wanted to be able to grow herbs and vegetables, something that hadn’t been possible in her other garden because of the deer. I proposed including some raised beds in the front yard because there simply wasn’t enough sun in the back garden, and she agreed. So here’s the plan I came up with. I needed them to be as unobtrusive as possible, and far enough away from the street so that passers-by wouldn’t be tempted to pick tomatoes or nip off a few herbs. 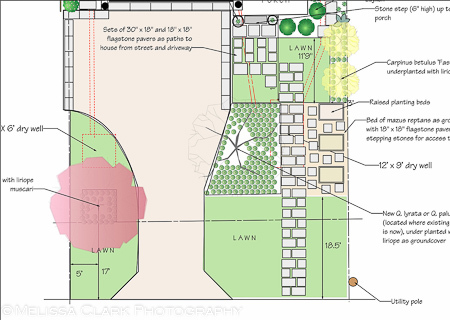 The front yard plan as you face the house from the street. See the three rectangles on the right property line, in the center of the yard? Those are the three raised beds, about 4′ x 3′ each. Stepping stones allow access to the beds for maintenance, and we planted Mazus reptans between them. 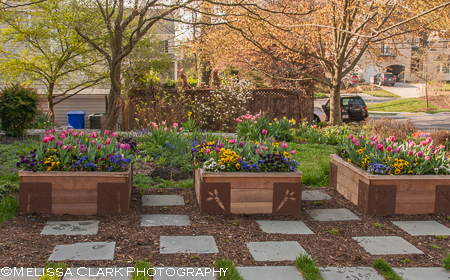 To dress up the beds, especially since this was a front yard, I had them constructed of high-quality cedar, and used M-Brace brackets on each corner. Brackets on the two outer beds have a “bamboo” design cut out of the steel; the center bed’s brackets sport a “carrot” design. By now you see where this is headed. We didn’t want the beds to sit empty all winter, just waiting for warm weather to be planted with veggies and herbs. So we planted pansies and tulips, and voila! A wonderful effect was created. Tulips emerging from the pansies just as the hornbeams to the left of the beds start to leaf out. Almost (well, not quite) like being in Holland. The beds now provide color in early spring, before the Okame cherry leafs out on the other side of the driveway. Rosalind Creasy is known nationally and internationally for her inspired landscape designs that use herbs and vegetables ornamentally. So it was a special treat to be given a private tour of her home garden during the APLD conference in the Bay Area last fall. Creasy explained how finding substitutes for more traditional plants (e.g., rosemary shrubs for boxwoods or other low evergreen hedging material) enabled her to win over her neighbors – and at the same time the design world – in her early years working in the garden. Now she lives in a residential neighborhood in the Bay Area with chicken coops in the front yard and edible plants framed within more traditional settings – patios and arbors, raised planting beds and “parterres” of rosemary. 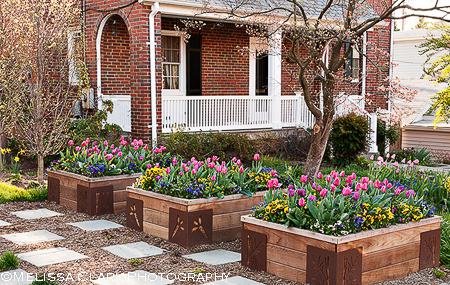 In our mid-Atlantic region, there is a renewed interest in raising vegetables in our gardens, so having the opportunity to see Creasy’s home garden was an inspiration. (OK, so rosemary shrubs would be a bit of a stretch here. But her encouragement to the designers on our tour to search out heirloom vegetables and think outside the box was wonderful). For more information about Creasy’s books, a link to her blog, and lots of useful advice about vegetable gardening, check out her website. Rosalind Creasy greets visitors under a welcoming arch framing the entry to her front garden. Vegetables fresh from Creasy’s garden. More produce from the garden. Profusion in structured spaces, the hallmark of good garden design, carried over into Creasy’s front yard vegetable garden. 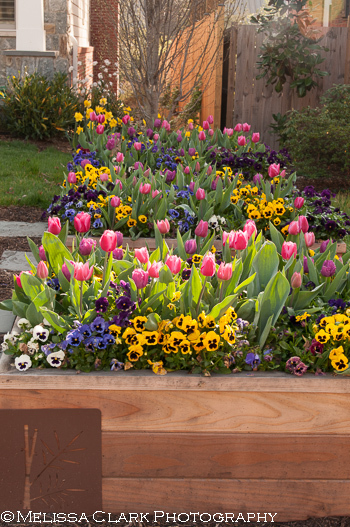 Annuals provide additional color in the garden. Red is a favorite color in the front yard. Creating hedges of rosemary allows an ornamental vegetable garden to look “tidier” – and thus more acceptable to traditional tastes – than might otherwise be expected. In the back yard, more shade – but still enough sun to grow herbs and vegetables. Non-irrigated areas in the back garden allow for bulbs to flourish as well.